If you are struggling to keep your business afloat, you might be encouraged to know that even the most successful entrepreneurs once had a shot at failure. However, most people concentrate on their successes; so they never get to learn from their failures. For instance, it’s easy to associate Twitter with its founder Evan Williams, but rarely do we associate him with Odeo, the podcast that he started and failed terribly. Other world-renowned entrepreneurs and billionaires like Bill Gates, Fred Smith, Ariana Huffington, Walt Disney, Warren Buffett, and Steve jobs have also failed before they become successful. It turns out that entrepreneurship is not a walk in the park; with eight out of ten businesses failing within the first three years. Business failure can be said to be a state where a company ceases its operations because it cannot generate enough revenue to cater for its running costs and make a profit. It may also be referred to as closure of an enterprise that leaves the creditors at a loss or a firm that stops working due to lack of profits or sales. One of the things that made these people successful despite the harsh environment was that their desire for success was more than their fear of failure. Staying motivated and focused on achieving your goals is one of the topics that are most spoken about but also hard to execute. So, what keeps the fire burning and strong amidst the challenges and disappointments you encounter on your way? Before getting started, make sure that entrepreneurship is something you desire from the depth of your heart. Do not start a business only because you lost your job or can’t find another. If this is so, consider hiring a career coach, getting some training or going back to school to acquire further skills. That way, you will have stayed true to your preference and the idea is likely to work. Also, consider whether you have what it takes to establish a venture. You need to be willing to make sacrifices and be self-motivated. “First mover advantage” is a term used to refer to the benefits of getting a big head start by launching a product before anyone else. This ideology is advantageous, particularly to small businesses that are trying hard to remain in business and conquer the competitive market. However, it has been overrated to some extent. If you cannot find an exceptional business idea, you can research your idea and find something unique about it. Is anyone else doing it? How stiff is the competition? Does your product or service solve any problem? If you are convinced that you will be addressing a specific issue, you can go ahead and set up the firm. There is an array of business options to choose from. Before starting the entrepreneurship journey, you should settle for the kind of business you want. Are you into manufacturing or the service industry? Do you prefer doing business online or are you more into the conventional way of buying and selling? Do you wish to keep your business small with low overhead or is the consultancy space more like you? Think about all these factors based on your skill set, level of experience and passion. Once you have decided on the type of business you want to start; the next step is to settle for a business structure. Tax planning begins even before the first day a company operates. Of all the decisions a business owner can make, only a few have a more significant impact than entity selection. Choose whether you want to be a sole proprietor, own a limited company, join a partnership or start a corporation. Regardless of the business you set up, always remember to set realistic expectations so that you do not end up disappointed. Before quitting a business, give it sufficient time to grow. Bear in mind that good things take time, and entrepreneurship is no exception. Besides, there is a lot to learn from the failures of these successful people. Their stories teach us that there is often some pain behind every glory we see, and those who stick around long enough are the ones you reap the benefits. 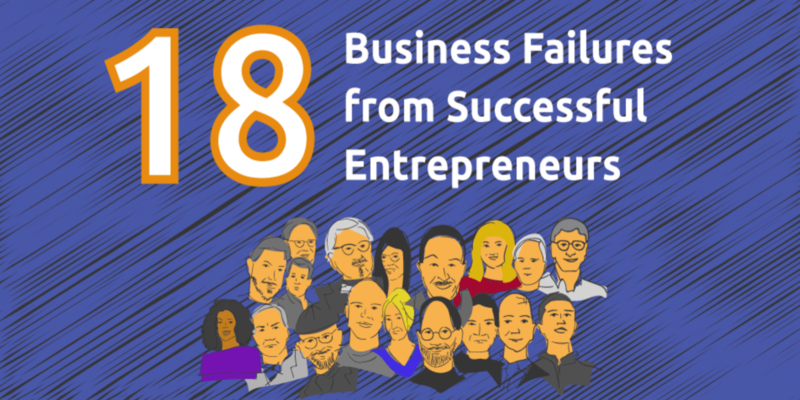 The 18 world-renowned entrepreneurs featured below had failed big before they succeeded. Infographic can be found here.